Midea top load washer getting an error code? Need help troubleshooting your washing machine? Below we have the common error codes for Midea top load washers. There are multiple Midea top load washers with different model numbers, so be sure to check your model number. Most error codes on Midea top load washers are the same. Some top loading Midea washers will have different error codes and different troubleshooting methods. 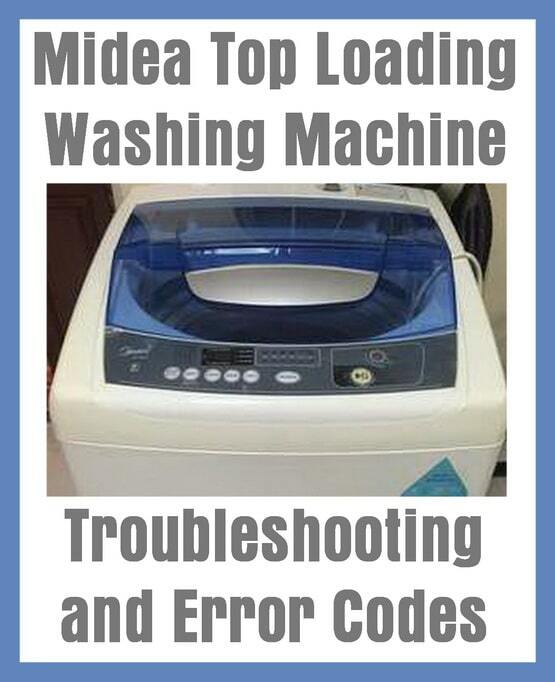 If you need error codes for Midea front load washers you will find it here. We also have the operation panel identification chart and what the buttons functions are and a washer parts identification chart. Use the error code and troubleshooting guide below to assist you in repairing your broken Midea top load washer. ERROR CODE SOLUTION: Turn off power, wait 5 minutes, turn on power and start washer again. ERROR CODE DEFINITION: EEPROM fail. ERROR CODE SOLUTION: It needs a Repair. Replace Control Board. ERROR CODE DEFINITION: Not enough water pressure. ERROR CODE SOLUTION: Make sure to turn on water tap, or increase water flow to washer. ERROR CODE DEFINITION: Draining not finished correctly. ERROR CODE SOLUTION: Check drain hose, and clear if required. ERROR CODE DEFINITION: Lid not closed. ERROR CODE SOLUTION: Close lid before it begins to spin. ERROR CODE DEFINITION: Clothing load is out of balance. ERROR CODE SOLUTION: Move clothes around in drum to balance the machine. ERROR CODE DEFINITION: Water level sensor failed. ERROR CODE SOLUTION: Remove and replace water level sensor. ERROR CODE DEFINITION: Power Voltage Protection error. ERROR CODE SOLUTION: Check power incoming to washer. REPAIR or CHECK: If the power is off or the fuse is burned out. If the water supply is cut off or the water pressure is too low. If the inlet hose is properly connected and the water tap is opened. If the filtering screen of inlet valve is blocked by dirt. If the “Start / Pause” button is pressed after the power switch is pressed. If the power supply voltage is too low. REPAIR or CHECK: If the water drain hose is placed very high. If the end of water drain hose is sealed in pond. If the internal rubber ring of drain valve is blocked by dirt. REPAIR or CHECK: If the door lid is closed. If all clothing piled largely at one side of barrel or the clothing is excessively placed. If the washer is not placed in stable condition or it is placed in inclination state. (The ground is not flat). If the motor belt is loose. IMPORTANT: During the spin process, if clothing is piled up at one side of the spin barrel, it will cause unbalance of spin barrel resulting in striking. At this moment, the computer inside the washer will feel this unbalance phenomenon and will automatically correct it (fill in water Washing). However, if unbalance situation is not removed after continuous three corrections, which means the computer auto-correction can not resolve the problem. Then the user has to manually and evenly place the clothing inside the barrel to solve the problem. 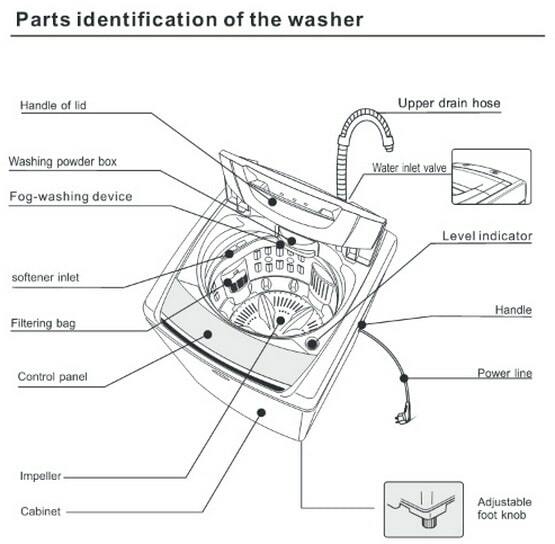 Need the users manual for your Midea top load washer? See below. If you have questions about your top loading Midea MT700W washing machine, please leave a comment below and we will be happy to assist. My Midea MB45 fills up with water but does not complete the wash cycle. The wash cycle starts then the machine stops washing – wash for about one to two minuets. 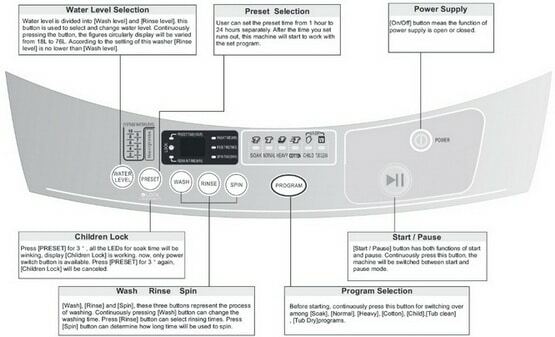 It does not move on to the next cycle unless I manually go through the functions and select the rinse and spin. Midea washing machine bought before 3 days , when continuing the washing ,it’s getting stop with showing E4 error and not complete the dry . The washer is constantly on drain mode, as soon as we set to wash and the water comes in the drum, the water just automatically drains. How do we fix it? Error code E2 keeps coming up. I have cleared the drainage pipe. Still same issue. How do I clean or check the drain pump? How can I Reboot the panel from the previous setting and e2 code? I left it unplugged overnight with no change. Is there a secret reset button? My Midea washing machine play/pause button is not working. I checked all water supply and everything is fine but play button is not working. My Midea Top Load automatic washing machine keeps on making E2 error. I clean the drain outlet and hose well but still on making E2 error. I just bought this 4 months ago. Unplug the washing machine before working on it. Did you clean the side lint filter? Did you remove the water pump and check it for broken parts and clogs. The back and bottom come off easy. There is a one screw bottom drain. Remove the hoses with a pair of channel locks by pinching the clamp tips together and twisting. The drain hose comes off easily. Slowly tilt the machine to let the water drain out. My Midea mae 80 washing machine has very low pressure flowing into the machine, I have blown into the hose to try and clear any blockages, the water pressure is ok for a few minutes but then the pressure drops again, kindly assist. 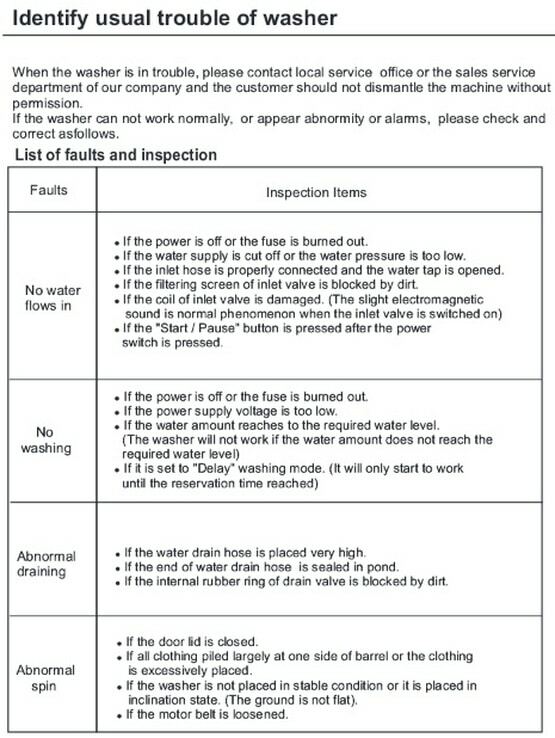 Have you made sure the water supply valves are fully OPEN. Take the water supply hoses OFF of the Washer and test the water flow into a bucket. If good, then the issue is with the WATER INLET VALVE on your Midea Washer. Check the water inlet valve to be sure it is not clogged or blocked and therefore not letting in water at the proper pressure. 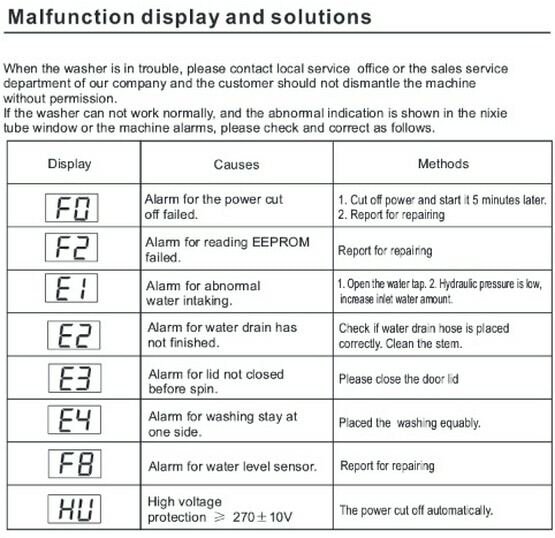 Midea washing machine problem, it displays E2b error. Midea Washing Machine E2 B Error = Draining has not finished correctly. Check drain hose and drain pump to be sure they are not clogged and clear if needed.